I think the cruise ship we’d seen anchored off the beach this morning went to this oil port after dropping passengers in Lucaya, though the town didn’t seem overwhelmed with tourists as we’d expected if a cruise ship was in. That’s definitely a cruise ship stirring up the coral sand by making tight turns at the dock. The air was less smoky, so we got a better look at some of the reefs on the southwest shore. For some reason this pic reminds me of those zillion-piece jigsaw puzzles with subtle color and shape variations that make it challenging to assemble them and are always missing a few pieces. Happily, this one is complete. Nearby another reef has a very different look and I wonder what diving in these two areas is like. We seem to have jumped through all the CBP and ATC hoops without serious misstep (tho I still have an illogical fear that an unmarked car will pull up and spill out a bunch of men in black). 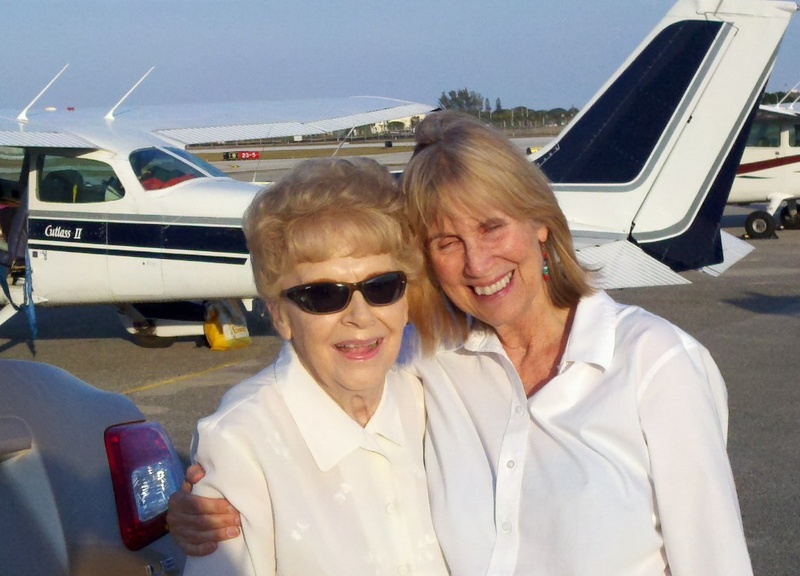 After landing in Ft. Lauderdale (KFXE) to take care of all that, we made an 11 mile beeline to meet sweet Georgia and Bob at Boca. He’s a former pilot par excellence, and it’s always fun to talk airplanes with him. Tomorrow I’ll show him this pic I got waiting in line for takeoff at KFXE, of what looks to me like a 1930s vintage classic. We’re happy to be back in FL where our phones work. Once we get net access I’ll share some words & pix. Meanwhile here’s Anne demonstrating how happy we are to see dear Georgia & Bob.